St. Patrick’s Day is just around the corner. 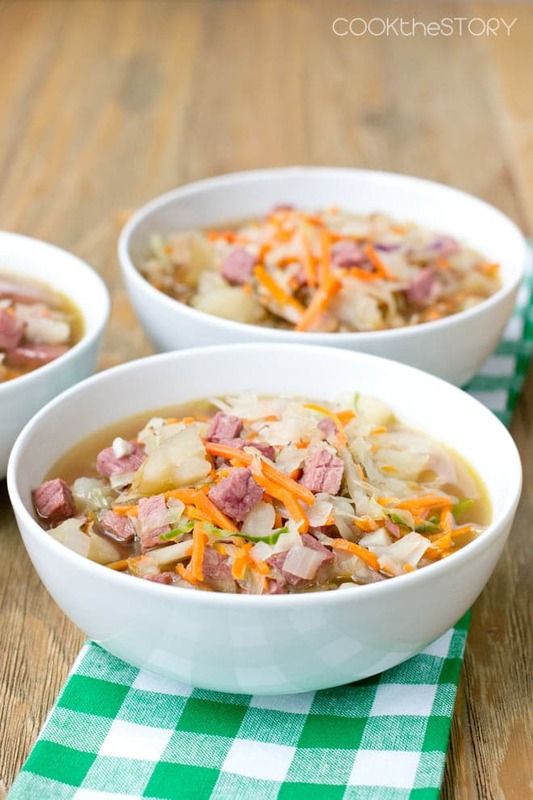 If you were hoping to celebrate with corned beef and cabbage but don’t have the time for the slow cooking the corn beef, this soup is for you. 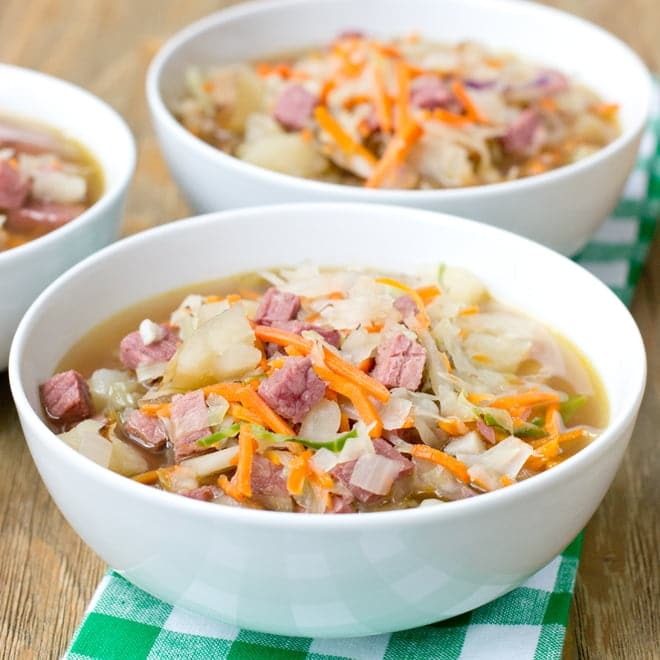 Today’s recipe has all the flavors of an Irish Corned Beef and Cabbage but in a soup. And it’s ready in only 15 minutes, which is way quicker than the typical Corned Beef and Cabbage dinner. This recipe calls for a bag of pre-shredded cole slaw cabbage so you don’t have to core and chop it up yourself yourself. Another great thing about the cole slaw cabbage is that it’s nice and thin so that it cooks quickly. 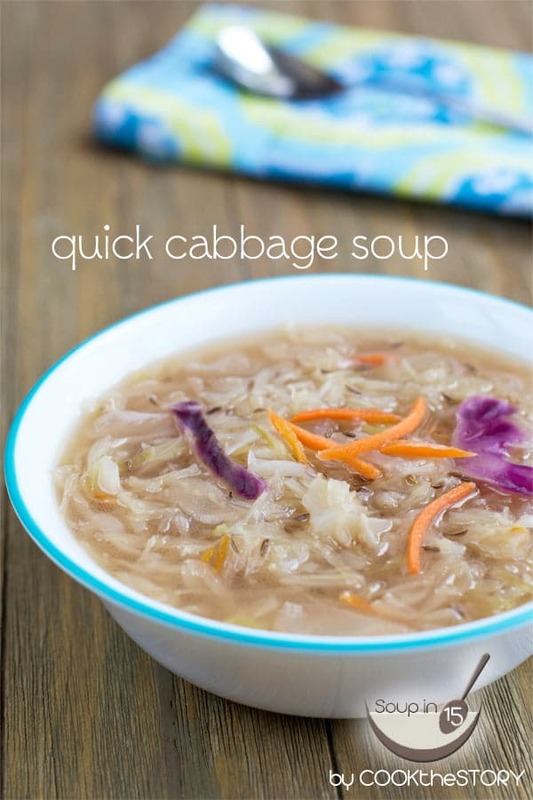 You might remember that I’ve used this bagged cabbage before when shared my recipe for Healthy Cabbage Soup with Caraway Seeds. That soup was a vegetarian one and caraway seeds really gave it a boost of flavor. 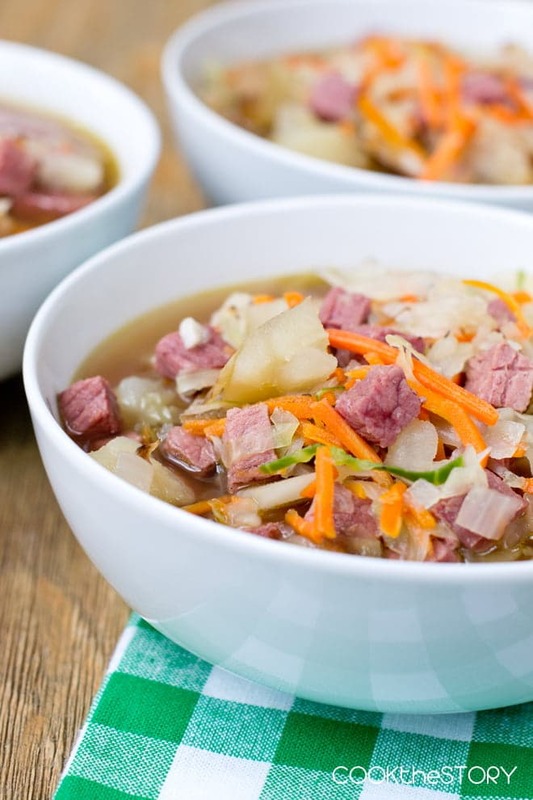 Today’s recipe is not vegetarian and it gets its blast of flavor from corned beef. When shopping for the corned beef, don’t go to the raw meat section for a corned beef brisket. Those take too long to cook. Instead head to the deli counter. Ask for a chunk of corned beef, not sliced corned beef. That way you can cube it, which is perfect for soup. 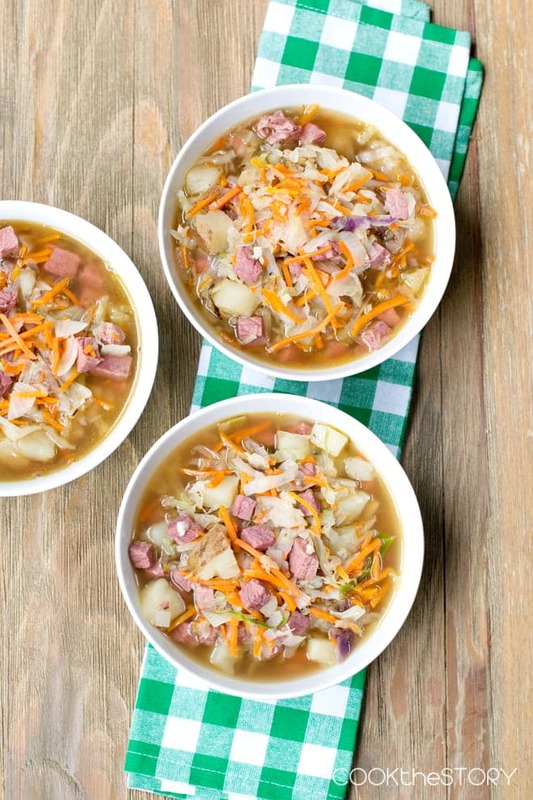 When looking for quick and easy ingredients to make soup, you can always consider getting meat from the deli counter. Hams, chicken breast, turkey breast, even salami and bologna. All of these will add salty meaty flavor quickly to your soup. But just remember to ask for a piece or chunk of lunch meat, not for it already sliced or shaved. Then dice or cube away. 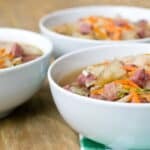 For more tips on making soups delicious quickly and to see all of my SOUPin15 recipes, head over here. If you want more quick-cooking tips and easy recipes like this, sign up for my weekly newsletter. You’ll get all the new ideas right in your inbox. Heat the oil over medium heat in a large pot or Dutch oven. Add the shredded cabbage, stir and then cover the pot. Roughly chop the carrot matchsticks and add them to the pot. Cover. Peel and chop the onion. Add it to the pot, stir and cover. Put the potatoes on a microwave-safe plate and prick them each a few times with a fork. Put them in the microwave for 3 minutes. Flip them over and microwave until fork tender, about 1-2 more minutes. While the potatoes cook, mince the garlic. Add it to the cabbage along with the allspice, dry mustard, salt, pepper. Stir. Add the chicken broth. Cover and increase the heat to high. Chop the corned been into 1/2-inch chunks. Use an oven mitt to get the potatoes out of the microwave and chop them into 1/2-inch pieces. When the chicken broth reaches a boil, add the corned beef and potatoes and reduce heat to a high simmer. Cook stirring occasionally until the veggies are tender, 2-3 minutes more. I just made this.We only had a little to try it out, and we loved it! I’m going to reheat it for dinner and add a grilled swiss cheese sandwhich. Deffintly a keeper! Traci, so happy you guys liked it! Just made this, and loved it!! My son also loved it!! Will definitely make it again and again! Carrie, so happy that you both liked it. It’s a favorite around in too! I could live off this soup! This is my kind of dinner, so delicious!! What a great looking soup! Love these flavors! !